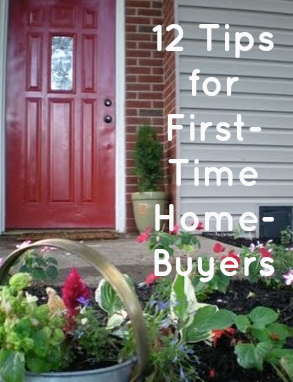 Here are a few things I jotted down about first-time home ownership! I am not an expert, by any means. However, these are some "if I knew then what I know now..." ideas that I've been sitting on for a while. If you're starting this new adventure, then I hope you find this post helpful! Feel free to email me with questions! In your mind, picture how much storage space you think you'll need and then multiply it. Just kidding. Kind of. All joking aside, think about how much storage space you have now vs. how much you think you'll need in the future. This is a biggie. Take it from the girl who bought a house with no linen closet. If you have a linen closet, give it a big hug. A good linen closet is not something to be taken for granted. A house comes with lots of extra "stuff." When we bought our house- an artificial Christmas tree, 2 lawnmowers, 2 ladders, 'nice' suitcases, and a piano (we inherited from Tim's grandparents) all followed suit shortly after. Having a house means you are an adult. Sorry. Maybe you should have been sitting down for that part. This means you're going to get some grown-up stuff. Stuff no one bequeathed you, loaned you, purchased you, or expected you to have when you were in an apartment or your parents' house. You will also be required to use words like "bequeath." Know what you'll be doing there. Do you plan on having kids in this house? Do you want to do a lot of entertaining? Will you be getting a dog? From what I understand, babies take up a lot of space and dogs NEED a lot of space. Is there a big yard? Is there a big enough eating area for a high chair? Is there ample parking for when friends and family come to visit? Is the master bedroom upstairs while all the other rooms (and possible nursery) are downstairs or vice versa? You don't want to constantly be traipsing up and down the stairs every time you need to get to your wee one. Don't get caught up with appearances. I'll admit, our house is a bit odd looking. When we pulled into the driveway for the first time, Tim's first response was, "...No..." However, once we noticed the big maple tree in the front, the open floor space, the fancy light fixtures, 2 FULL bathrooms, and the huge backyard, we were hooked. We've had fun landscaping and re-doing the driveway. I think the exterior of our house has become like those squishy-faced dogs. So odd-looking that you can't help but love them. Think about the small stuff. We have a front door and a back door (nifty, huh?). With no garage and no basement, we have to work super hard to keep our front yard picked up. Things like sidewalk salt, potting soil, wood-cutting tools (for the wood stove that is located right next to our front door) and other items we need for the front of the house all have to have a place. It would be nice to have a side entrance with a covered porch or deck area where we could neatly stack things in a corner somewhere. Things like this may seem minor, but several seemingly small annoyances could add up to one big, fat NO when it comes to what you want in a home. Location is another seemingly small detail that could mean BIG things. Our road is not a through street. I love it because it's quiet. I hate it because there is only one entrance and exit...and we are within walking distance of the Catholic church. You'd have better luck trying to get Taylor to cover a song with Kanye than getting out of our road after Mass on Saturday. Bah! If you've got a house in mind (and it's empty), take a look at the yard after it rains. If it's collecting lots of water, this could be a sign of a drainage problem- which could mean bigger issues in the future, especially if there's a basement. Ask yourself, "is it move-in ready or MOVE IN READY?" We ended up adding some things to our house when we moved in...or at least within the year. A garbage disposal, a ceiling fan, an outside water spigot, a dimmer for the dining room light, hardwood floors, new blinds- those may seem like small details, but the expense adds up after a while. Something else you need to consider is how much work still needs to be finished? We looked at a house we really liked, but the sellers had bailed on the unfinished downstairs bathroom. It was unsightly and a bit of a mess. As busy newlyweds with no plumbing experience, that was a project we knew we weren't ready to tackle. Be brave. We ended up saying "no" to several houses I LOVED. Unfortunately, buying a house is no time to be optimistic. Yes, that crack will get bigger. No, that family of possums living under the porch won't agree to pay rent. No, that horrible scent you smell isn't "coming from outside." Get to the bottom of it. Divide & Conquer, whatever you have to do...and then be prepared to say no. Be realistic. If you have student loans, if you are driving the same car you drove out of college, if 1/2 price sushi is your idea of a night out then good for you. I think we're soul mates. Don't get me wrong, there is a small percent of 20 somethings who are making BIG BUCKS and swaggin' it up in million dollar townhomes. However, for every high rollin' newbie, there are 5 who made the same types of purchases and are struggling to make ends meet. Sure, they've got 5 bedrooms, but they've only got enough money to put furniture in one. Oh, that in ground pool you see? It's empty because they can't afford the chemicals to treat it. Your realtor may try to get you to look at a few houses that are somewhat out of your price range. Remember, at the end of the day, they've got commission on the brain, and you can't really fault them for that. However, stick to your guns. You'll get your laundry shoot/walkout basement/moat filled with crocodiles eventually! Remember, your starter house will also have a lot of good qualities that your next house won't! You'll miss those when they're gone. Trust me, I'm already mourning the loss of our giant maple tree! Don't be afraid to negotiate. You'll be surprised by what sellers will agree to- especially if they've been sitting on the house for a while. When we bought our house, we insisted that the leaky fridge be fixed and inspected. My best friend from college purchased a condo with a really sweet fish tank/wall-insert-set up. She not only landed the fish tank and gorgeous accessories- she also go the fish to go with it! Look at the foundation. We found a house I absolutely loved. Hardwood floors. Garage. Large Windows, quiet street... and a big, fat crack in the foundation of the basement. I wanted this house so badly, but in the end, we decided against it. A crack in the foundation wasn't something we were prepared to deal with, and no amount of hot glue or duct tape was going to fix it. Consider the source. Our house is heated by propane. For the love of Pete, propane is expensive. If you are heating with propane or fuel oil, make sure you have a hefty amount in your savings for when the time comes to have your tanks filled. Unfortunately, my friend, this means adding money to your savings all year long! I know it's hard to fathom when it's 98 degrees and sunny outside, but eventually, the world is going to get quite chilly again. To the best of my knowledge, our company didn't have any kind of payment plan or even billing when it came to filling our tanks. We now use electric baseboard heaters, space heaters, and the wood stove, and we're much happier. For the love of Pete, know what you're doing or find someone who does! Tim constantly amazes me with his knowledge when it comes to the business-world. He uses words like equity, A.P.R., and Escrow. I teach little kids how to read. Ask me the difference between zaner-bloser and d'nealian, and I'm your girl. I don't know about home loans. Do the research or find someone to help you along (a trusted friend or relative, not someone who is trying to make a buck off you). You won't regret it! If you are the praying kind, then by all means, pray. Tim and I had a specific price in mind. When our realtor asked our price and called the sellers, the first words out of Tim's mouth were, "We should pray." One of my favorite memories of those early years involves us kneeling together at the foot of my bed praying that the sellers would take our offer at a specific price. It hasn't been an easy road, by any means, and I don't know what the future holds, but (fingers crossed), I think we found a winner. Hmmm.. I agree that finding someone who knows what to do better than you is one of the good things to do when it comes to buying a house. But investigating before getting things done is the next step after having it all planned out. These are a few things that every potential home buyer should keep in mind. That information that you've provided were very useful. Thanks for sharing! This post were very valuable and useful. I was well informed with your post. I will refer this to my friend. Thank you for sharing. These are great tips for potential home ownership candidates. Thanks for sharing them! Blessed Trinity or something like that.